The actor: As low key as many of his characters often are, Cillian Murphy manages to bring a sense of imminent foreboding to each, making their subdued nature all the more ominous. The Irish actor’s exposure to audiences in the U.S. came by way of his role as Jim in Danny Boyle’s zombie (before zombies were cool… again) film 28 Days Later. Instead of playing a character that fulfills the zombie genre’s traditionally shrill response to the undead, Murphy’s Jim was a nihilistic walking shrug gradually realizing the fragility of human nature and its looming extinction. Subsequent films like Inception, Sunshine, and Broken found Murphy working in a similar realm, breathing life into characters more carefully introspective than hubristic. 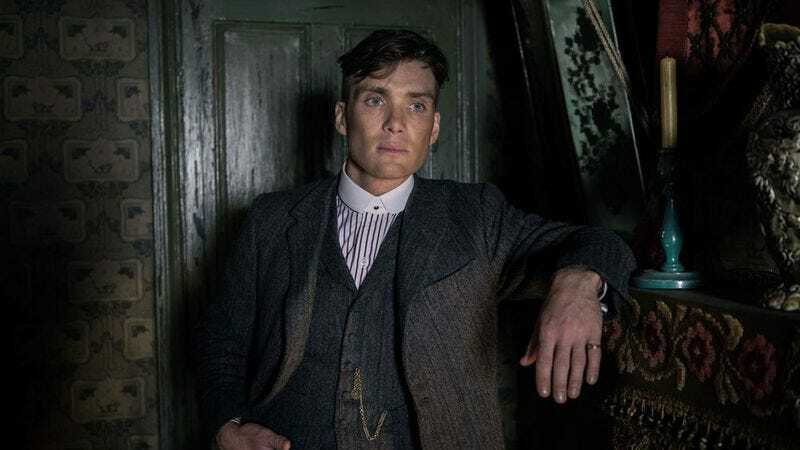 As Tommy Shelby in Peaky Blinders, Murphy gives a potent and subdued performance that offers a fascinating look at the power of influence over the unassuming. With the show’s recently released third season, the progression of Shelby’s character provides Murphy the opportunity to delve further into what’s become an impressive repertoire of idiosyncratic characters. The A.V. Club: Tommy is less brooding in this season of Peaky Blinders. He’s kind of experiencing the Michael Corleone gangster metamorphosis. Cillian Murphy: [Laughs.] Well, I think as the show evolves and grows, it’s necessary for the character to evolve and grow. It wouldn’t be interesting for us making the show—or the audience—if everybody just remained the same, because what makes things interesting and dramatic is change and pressure and things like that. Because of that, we were very keen this season to push the characters and how we presented them, and that was in the writing, but it also came from the director and myself and the other actors. I think this is the most under pressure we’ve seen Tommy, although ostensibly it’s the apotheosis of his criminal career. [Laughs.] Materially, anyway, but emotionally and psychologically I think it’s the most under pressure that we’ve ever seen him. I think for the first time we’ve seen that he may have bitten off more than he can chew, so we wanted to show that and how the character reacts to all of that. AVC: Does that prolonged portrayal of a character in a series come with its own different kinds of challenges as opposed to film? CM: It poses a challenge, but it’s a really positive one. Unless you’re the main character in a feature film, everyone else’s story is kind of compressed, and even as the lead character you’re still trying to compress everything into two-and-a-half hours. Whereas in long-form television, you get to really investigate this sort of most unlikely part of the character’s psyche. You get to really go into great detail, and that’s a gift for an actor. It’s 18 hours now that I’ve played Tommy, and we’re going to do another two seasons so that’s going to be another 12 hours. That’s a lot of television and a lot of time that I’ve lived in that character’s shoes. You feel like you get to explore parts of a character that you never really get to do in any other medium. Certainly not in film or theater. I think that’s what’s attracting a lot of actors to television these days. AVC: So it’s more rewarding? CM: Definitely. I think it’s been a sort of slow process since those sorts of shows began. It took a while for that sort of snobbishness around television to disappear, and I think it’s completely disappeared now. What I find really nice is the cross-migration across the two forms. There’s a lot of actors who have a TV show, and they’ll also have a very healthy film career, and similarly with directors as well and writers. It feels like there’s a cross-pollination that’s really healthy at the moment. Similarly for audiences, too, I think because they still enjoy going to the cinema and enjoy that experience of being in a darkened room with 200 other people, but then they enjoy watching stories in the privacy of their own home and maybe watching six hours of television. [Laughs.] Or however much they want. So I really think it’s a healthy time and particularly for writers. CM: That’s sort of a special one because I’d played the character on stage. I originated the character on stage, and it was the first professional role I’d ever had as an actor. That’s when I was like 19 or 20. I became an actor because of that play and made some of the great changes of my life through that play. We toured it for about 18 months across the world, and then the play finished. Four years later they decided to make a film of it, and Enda Walsh—who wrote the play—also ended up writing the script. We made it, and it was kind of tricky because they didn’t cast Eileen Walsh who’d played Runt in the play. That was a bit traumatic for me and for her and that friendship, really. I think the film succeeds to some degree. It’s always hard transposing theater to film. I think this was a particularly theatrical piece of theater. It was just the two of us on stage playing all the characters, and then obviously we had to make these characters real and give it some structure. I enjoyed the character, though, very much. It’s quite an extreme character. Very violent but sort of well meaning. I loved the sort of black or white nature to [Darren’s] approach to love as, “If I can’t be with you, then I can’t be alive”—there’s something very powerful about that, I think. I think Kirsten Sheridan, the director, realized that as well. It was a big step for me as an actor—translating that character into film—because it was one of the first lead parts I’d had, and I thoroughly enjoyed it. AVC: You started off in theater, and you’ve continued to go back throughout your career, too. CM: Yeah. For me, when I started acting, I was only interested in theater. The film thing came later, and I was open to it to get Disco Pigs as my first sort of barbecue. Then I worked exclusively on stage in Ireland and the U.K. for about four years. I worked with great directors and great writers, and I was very lucky to kind of learn my craft onstage. The films happened very slowly and incrementally where I got a smaller part and then a slightly bigger part, so there was none of that catapult syndrome, which I think can be a little scary for young actors. I still love theater, and the thing I most enjoy about doing both is that with theater you have to act with your whole body and theater is always the wide shot. You’re always acting within that wide shot. It can be an interesting wide shot, too, if people are in the guards watching you. [Laughs.] With film it’s all about thinking and the close up, so it’s great to be able to exercise both of those muscles, so I try to go back to theater as often as I can and as much as possible. CM: It’s funny because I think Disco Pigs is how Danny Boyle had first heard of me. Not many people did at first, but luckily did after he’d seen it. I auditioned really hard for this one. It was about five or six auditions to kind of convince Danny that I was the right guy for the part. I was aware that this was the first time working with a name director. I’d grown up on Danny’s films and was a huge fan of his, so I really fought for that one. At the time, we thought we were making a small, little British independent film, and in fact I didn’t even think we were making a zombie film. I’d never seen any of the [George] Romero movies, so I was totally ignorant about the genre. I thought we were making a sort of allegory about rage and the state of modern society, which, in a way, I suppose it is. For some reason, though, it clicked with people. As always happens with independent films that work, it’s always the American market that’s important, and it broke in the American market and started off this whole slough of zombie movies again. It was a great thrill just to work with Danny, and I felt like I had to step up my game with that. It was a lead part, and I suppose by virtue of the fact that the movie made some money, then people in Hollywood wanted to have a meeting. [Laughs.] That’s the transparent nature of the business. His whole thing with that franchise was grounding it in some sort of reality, so that you could relate to these characters as human beings and so Gotham City was a relatable environment. So we spent a lot of time just working on that, and it was a very exciting time for me to be working on something like that, of course, but to also be working with such a gifted director. It began the start of a relationship, and now I’m just about to start working with him on Dunkirk. It’s worked out really nicely for me. He’s been very loyal to me over the years. CM: Well, that was all in one year and a total quirk of distribution. I did Batman and then I went off and did Breakfast On Pluto, then I went to do Red Eye, but Batman and Red Eye ended up coming out in the same year, so I was the go-to bad guy. I was pissed off about that, to be honest, because your whole career is based on variety in playing a bunch of different characters, which I think I’d demonstrated up to that point. It just happened that they came out one after the other. [Red Eye director] Wes Craven, though, he’s greatly missed, and he was a master of his craft. I thought it was a very clever piece of writing, and I liked the duality of Jackson to be this charming, suave guy who sort of turns out to be the devil. [Laughs.] That was the most fun part of it. Again, it’s another one of those I didn’t expect would click, but it did. I loved working with Rachel [McAdams]. She’s a really tremendous actor, and the two of us had a lot of fun. But yeah, for a year I thought I was setup with the bad guy tag, but thankfully I’ve shut that off. CM: That really was a very special experience. We were making a film about the war for independence and the civil war in Ireland. It split the country and split families, and no one had really ever tackled this before. It affected my family in sort of explicit ways, so I felt a lot of responsibility. In this case, with [Director] Ken Loach—who just won his second Palme D’Or—it took somebody like him to come to Ireland and make a film that’s as sensitive as this one and do such a wonderful job with it. We shot that film at home in Cork, and I stayed with my parents. We were shooting out in the hills there where I grew up, and it was a very special kind of time. Of course, then for it to be received so well and to win the Palme D’Or, and for everyone in Ireland to go see it in such numbers—it was something that’s still very special for me. CM: The script was so phenomenally clever with this one thanks to Alex Garland who’d also written 28 Days Later, and I loved the way it was this sort of cerebral, challenging movie dressed up as a blockbuster. I thought it asked a lot of questions about science and religion, and I was really taken with it. I think it’s one of Danny [Boyle]’s most visually beautiful films as well. He did an absolute cracker of a job on it, and of course [Cinematographer] Alwin Küchler really nailed it as well. It’s a hard thing to make an original science fiction movie that’s this sort of narrow corridor to walk down without brushing shoulders with these extraordinary films like 2001 and Alien. But I think there’s an original take on the genre with this one. CM: This was a challenging one, and it shows up again, because there’s this sort of flaw in executives’ and producers’ thinking where they feel like movies have to be dumbed down for the audience, because they assume the audience is less intelligent than them. What Chris [Nolan] does with his films, though, is he presupposes that level of intelligence with his audience, and that movie went on to make some sort of crazy amount of money, but it showed that the audience is out there for clever, challenging films. It was something where we tried to have my character and Leo [DiCaprio]’s character to have the relationship where he’s the key emotional story, but for my character to sort of reflect that emotional story. Robert is the audience’s point of view a little bit, too, because he’s the mark of this heist. The audience saw it through my eyes, and [Chris] and I talked about that a lot for this. To play this super rich kid who has everything he could possibly want for in the world materially, but all he actually wants is the love of his father—that was how we wanted to portray him, as a love-starved little boy.